I enjoyed this book so much! My favorite gift this Christmas Day from my friends! Hats off to Private Collections! The writings on this book is jargon-free. Easy to understand and enjoy. 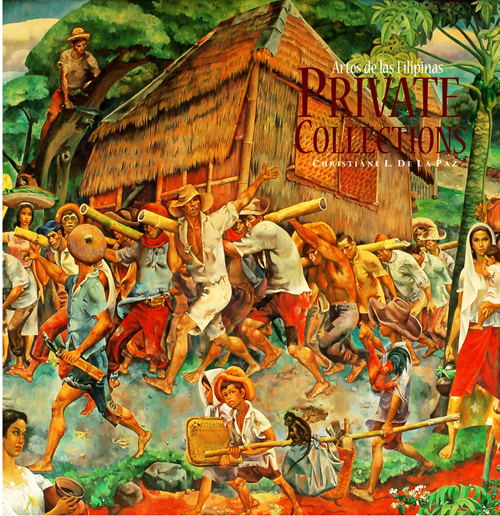 We have received our ordered copy of Private Collections here at the National Art Gallery in Singapore. It is wonderful and beautifully published. Also, very relevant reference on Philippine artists and collectors. Greetings from New York, New York! We admire this book project very very much. Myself and other Filipino art aficionados here are very proud that this kind of book was published. Congratulations to our kababayans and Artes delas Filipinas! The collectors in this book make us proud of how you live your lives as art collectors in the Philippines. Thank You for sharing your stories and collections to us. Well-written. I hope more art collectors were covered but a good good book on private collecting. I am happy to have received a copy of this from Mrs. Lina Hidalgo. May I say that I smiled when I finally owned one. Congratulations. I understand the points of view of the author in this book but I wonder, why was the art collections of Paulino Que and Jaimie Laya not included? What I like about this book is that it is not a coffee table book in a sense that the reader is presented with an ocean of artworks and no content was provided about the subject of the book. The author did a good job in presenting the private activities of art collectors in the Philippines. One wonders if all these collectors with big personalities only select and collect then sell their collection to make money. I was happy to know that the chosen art collectors collect with their minds and hearts. They do it for personal pleasure but also give back to society by exhibiting their collections for the public to know that such works of a particular artist exist and that it is found in their collections. While majority of the artworks covered in this book are first-rate, the author did not discriminate in putting the lesser-known artists found in their collection. For me, this is a bold and wise decision because in reality, not all first rate artists are found in private hands and not all collections by known art collectors are first rate. I also like the fact that the “top collectors” covered in other art books are not found in this book. To me, the collectors in this book are a good representation of the art collectors in the art circle. On the minus side, while the book is obviously pricey, I also find it very heavy (at 3 kilos!) and also text-heavy. This is not a book that I can just grab and read and bring along with me to pass time. But while these may seem like small points, of course, I would rather spend hours and hours reading a book than spend five minutes of my time browsing pictures. Each individual art collector in this book has a purpose and meaning in relation to their collections. In a way, art collectors are like artists because their art collections reveal about their backgrounds, points of view, ambitions and personal visions. Although more than one private collection has interested me, the one that really stood out most was the art collection of Joel Jimenez for his massive collection of Ramon Orlina sculptures. I have a strong admiration for the artist and his choice of trademark glass medium. I find it innovative and modern which is a reflection of my taste. Others that struck out to me were the collections of Joey de Leon and Patrick Reyno. Overall, what I learned from this is book is that the purpose of art collecting is to keep history alive. For art students, this book can broaden their minds on how far the local art scene has gone and they will also discover the new generations of artists who have contributed in making the Philippine art scene flourish.